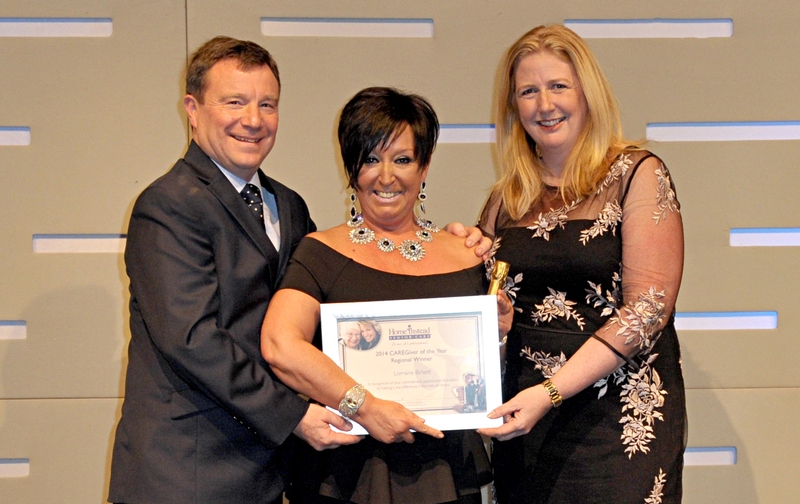 Saturday night was a very special night for us, as we crowned our 2014 CAREGiver of the Year. There wasn’t a dry eye in the house at the glittering CAREGiver of the Year awards ceremony, which celebrated the wonderful work of our dedicated team of CAREGivers who together care for more than 8,000 people across the UK. Of the five shortlisted CAREgivers, it was Lorraine Birkett from Newcastle-upon-Tyne who scooped the top prize. Selfless Lorraine was chosen because of the very special care and attention she gives to her clients, who she treats as if they were part of her own family. Her first class care even extended as far as taking a couple with Alzheimer’s on a very special holiday to Italy – and when her own mother was seriously ill in hospital, she insisted on continuing with her work. Lorraine, who joined Home Instead two and a half years ago, says she loves her job and is delighted that our ethos means she has finally been given the time to care. Lorraine said: “Home Instead knows what our elderly clients and their families need - in a nutshell… time! That is the time to deliver a top quality service, which is flexible to enable our clients to live in their own homes for as long as possible. Sue Perry, from Shrewsbury, Ludlow and Oswestry. Sue makes ‘memory books’ for her clients to help them and their families remember special times in their lives. She says being a CAREGiver is not just a job – her clients are part of her life. Sandra Capper, from Crewe. Caring Sandra grows her own vegetables and takes them to her clients to ensure they eat well. She enjoys taking her clients out, having a laugh with them and making a real difference in difficult times such as end-of-life care. Ashleigh Webb, from Epsom & Mole Valley. Ashleigh is proof that you don’t have to have worked in care to be a good CAREGiver; she had had no formal care experience before joining Home Instead. She loves building relationships with clients and says the job has made her a happier person. Tamsin Macbeath, from Weston Super Mare. One of our younger CAREGivers, Tamsin was described as giving one elderly client – who had 69 previous carers in just 18 months - ‘a reason to live’. Sam Brocklebank, Co-founder of Home Instead Senior Care, said: “Lorraine and our four superb finalists are a shining example of the high quality care that we aim to provide and I congratulate them on their success. “I’m passionate about raising the standard of care for older people in this country. Care can never be a one size fits all solution. “Our CAREGiver of the Year award winners each demonstrated that understanding every client, taking time to know their personality, what matters in their life, and most importantly what makes them smile…is what it takes to make care a quality experience. Could you be a Home Instead CAREGiver? Find out more about what it’s like to work with us here.